The basis of diabetes is one of blood sugar instability often caused and maintained by the Standard American Diet (SAD). Diabetes has a significant genetic factor in its development, though diabetes is not found in countries that eat appropriately-this means avoiding the SAD. It is important to maintain visits with your conventional endocrinologist but the key is understanding diet and nutrition. There are many research indicated nutrients and botanicals for the treatment of diabetes as well. Rome was not won in a day and healthy eating is the same. Non-industrialized Countries have very low occurrences of Diabetes. 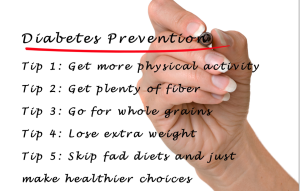 Diabetes and blood sugar issues lead to many forms of chronic diseases. These nutritional choices cause what is called Metabolic Syndrome which leads to cardiovascular disease, diabetes, possible development of cancers, neurological decline and other health concerns. In general the syndrome has been identified as having input into many differing forms of chronic disease. The take home message is metabolic syndrome is a disease of poor nutrition and lifestyle. It is a precursor to poor health and identified through a combination of common blood markers through tests such as a CBC and metabolic comprehensive panels. Catching metabolic syndrome early means catching diabetes and other chronic health concerns early. The key is prevention. Naturopathic doctors are trained like no other doctoral level health professional in the diagnosis, management and treatment of this syndrome. A Basic Understanding of Diabetes Can Control Type 2 Diabetes! The classic presentation of diabetes is characterized by the three Ps: polyuria (frequent urination), polydipsia (increased thirst) and polyphagia (increased hunger). Hypertension and the development of heart disease are of large concern. Complications arise by poorly handled blood sugars such as kidney, retinal and limb damage. Blood sugars are tightly regulated by the hormone insulin which lowers blood glucose levels. Blood glucose is the major form of fuel for the body. Hence diabetic blood sugar difficulties will make impacts on all the systems of the body. There are three forms of diabetes, known as type 1, 2 and gestational diabetes (pregnancy induced). In type 1 insulin dependent diabetes the beta islet cells of the pancreas, which produce insulin, are damaged. Hence insulin production is limited and blood sugars tend to be very high. This disease demands insulin treatment. There are some botanical medicines that have some research to restore beta islet cells. Insulin is unquestionably still a must, but it may be possible to slow the destruction of B islet cells with such medicines and other naturopathic interventions. Type 1 diabetes has an autoimmune component and often starts in childhood. Diary consumption may be associated with B cell islet destruction and should be discontinued at once. Type 2 non-insulin dependent diabetes is where insulin is not readily accepted by the cells due to cell receptor insensitivity. Type two is the greater majority of diabetic cases and is the focus of discussion here. Metabolic Syndrome or Syndrome X is generally believed by many holistic doctors to be the cause of the development of type 2 diabetes. Metabolic syndrome is a combination of diagnostic blood markers that leads to the development of diabetes and cardiovascular disease. Some estimates suggest that 25% of the population have metabolic syndrome. The following characteristics greatly increase your risk to the syndrome: obesity, diet, sedentary lifestyle, aging and genetics. The consumption of the standard American diet is high in simple sugars (as opposed to complex carbohydrates), poor quality fats, low fiber and low vegetable consumption. All these factors result in some way or another to spiking of blood sugars, followed by blood sugar instability and finally general metabolic instability. The rising and falling of blood sugars causes the receptors on cells to become insensitive to insulin leading to type 2 diabetes. Depending on an individual’s commitment to their health and nutrition, weight and blood sugar control, holistic medicine has much to offer diabetes. No matter what level of disease involvement people can start a program and make continued changes in their treatment as they see results. It is very important that individuals be under the care of a trained doctor. The rest of this page is mostly based on blood sugar control through education on the glycemic index (GI). While GI is not the only important nutritional topic (fats, fiber and protein are very important as well) GI is generally poorly understood by the public. Learning and applying the principles of GI diets will revolutionize a diabetic’s life. Diabetes is a very complex disease. Blood sugars have impacts on most system wide patterns. Many disease processes can either be helped or hindered depending on blood sugar levels. A foods ability to raise blood sugars after consumption can be found as a numeric value in the Glycemic Index. The index is 0=100 with pure white sugar as 100. The glycemic index does not necessarily correlate with the amount of carbohydrate in a food item. For example orange juice has a higher GI then apple juice. But apple juice has more carbohydrates. When one is considering the GI they should consider the numeric GI value and the total number of carbohydrates. One can purchase a GI book from most any book store. Diabetics should consume no more than 50 points on the glycemic index (GI). Keep in mind that total number of carbohydrates can’t be overlooked. Just because an individual eats below 50 points on the GI doesn’t mean total diabetic control. There is more to nutrition for diabetics then presented here. Weight management and exercise are crucial to blood sugar control. Examples of high glycemic foods/simple sugars/empty calories: white sugars, candy, white pastas, cakes, fiber depleted breads, white potatoes, sodas etc. The most important aspect of diabetic control is low glycemic index (GI) and low net carbohydrate (NC) = leading to a reasonable glucose load (GL). The table below shows values of the Glycemic Index (GI) and Glycemic Load (GL) for a few common foods. GI’s of 55 or below are considered low and 70 or above are considered high. GL’s of 10 or below are considered low and 20 or above are considered high. Also, it is important to spread the consumption of calories over a number of meals. When you exceed needed calories per meal the unused calories are stored as fat. Eating 5 smaller meals is superior to 3 larger meals due to less digestive overload.